Not all predatory insects live above ground like ladybugs and wasps. Many spend much of their lifetime underground.While weeding my onions, I had a chance to see a life and death struggle between a predatory insect and its prey — a cutworm larva. Normally, cutworms stay underground during the daytime but, my weeding disrupted the soil and brought it to the surface. A species of ground beetle noticed the cutworm too. I stayed very still so not to scare away the beetle. Sure enough, it attacked the cutworm. A major battle was underway that lasted several minutes. You can probably guess who I was rooting for. 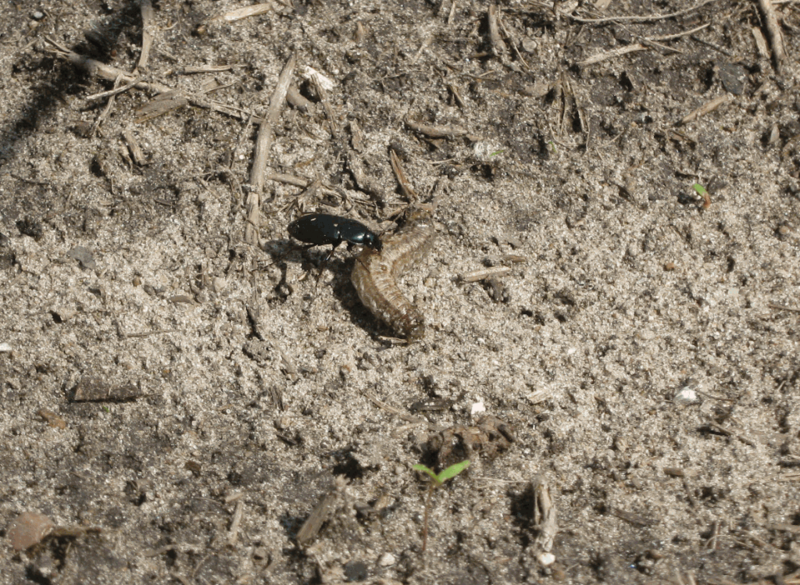 The cutworm fought back against the ground beetle by biting and squirming. The sun was very bright and was taking its toll on the beetle — he finally gave up. The cutworm crawled away as fast as it could to find shelter. My idea was to pick up the worm and toss it to the chickens as a snack. But, just before the cutworm ducked under some leave litter, a tiny insect — not much more than one-sixteenth of an inch long – flew in out of nowhere. In a split second, it lightly landed on the cutworm then just as quickly flew away. It was a predatory wasp that stung the worm and laid a clutch of eggs under the cutworm’s skin. Those wasp eggs will immediately hatch and the wasp larvae will begin feeding on the innards of the cutworm. I let the worm go so that the wasps could complete their life-cycle. In the struggle between predator and prey insects, the cutworm may have won the battle but it lost the war. Last Saturday I went on the Ann Arbor Garden Walk. If you’ve never been on a garden tour like that, I encourage you keep an eye out for one in your area to and check it out. You never know what you might discover. Plus, it’s fun seeing how each gardener approaches garden design in their own way. Usually, I don’t see plants I’m unfamiliar with. In my many years of professional gardening, I’ve grown umpteen varieties of plants. In this tour, one plant stood out for me, one I’d never grown before — Duranta. I had to do a little research online to find out some more about them. 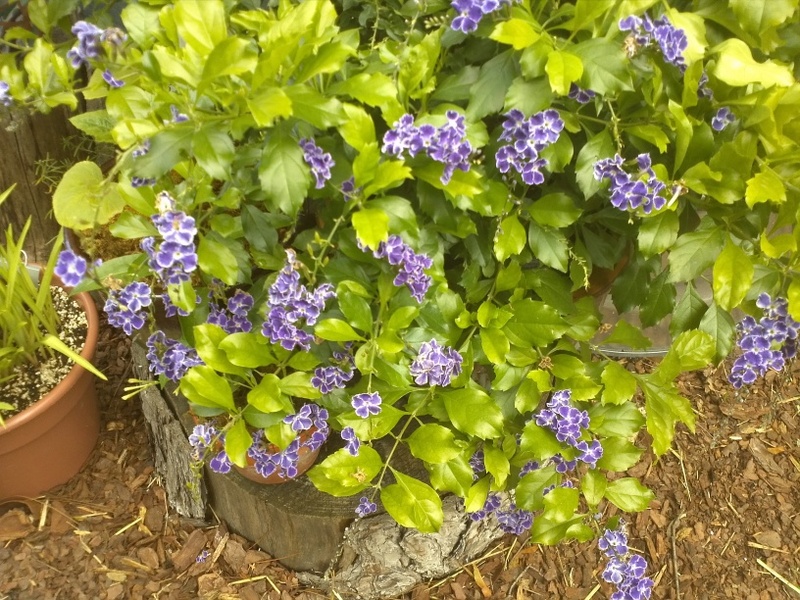 Duranta is a perennial shrub that is hardy to zone 10 or so. So, around here we have to grow it either as an annual or in a pot and bring into the greenhouse each fall to over-winter. This Duranta was in full bloom at the Ann Arbor Garden Walk. In all my years of gardening, I don’t recall ever seeing Duranta being offered for sale, either as transplants, cuttings or seed. Discovering this plant on the garden tour was well worth the price of admission. Aquilegia — or columbine — is one of the easiest flowers to grow. It is a perennial that also produces viable seeds. Therefore, it can re-seed itself. Basically, once you get it established in your garden, it pretty much takes care of itself and comes up year after year. They do have their own set of problems, however. 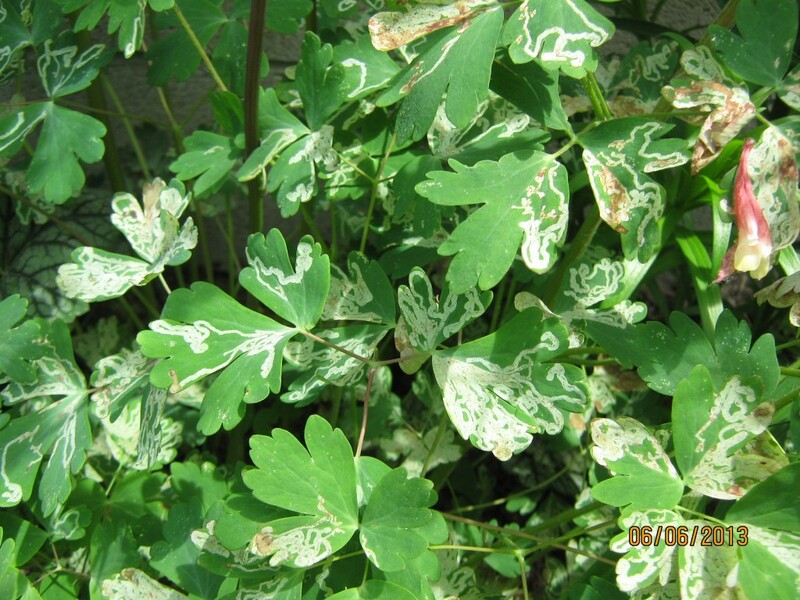 The most common pest you are likely to see is the columbine leaf miner. The leaf miner is the larval stage of a fly that attacks the leaves of the columbine. It hatches from an egg laid by a female fly. The larva feeds by burrowing between the top and bottom surfaces of the leaf chewing tunnels as it goes along. This mining of the leaf is how it gets its name. Because the miner lives inside the leaf, it is protected from most insecticides. Fortunately, even though the leaves can look quite bad, the leaf miner doesn’t seriously hurt the plant. There are several generations of leaf miners each season. Spraying insecticides doesn’t help the problem and can actually make matters worse by killing off the leaf miners natural enemies. The best way to minimize the damage is to pick off and destroy any damage leaves as they appear. Then, in the fall take out all of the old leaves and tops and get rid of those too. In my case, too many leaves have miners in them — I’m guessing well over 80 percent. Since the plants are not showing any signs of weakening, I ‘ll just let them go until fall.